MOBILE MEASUREMENT IN GOOGLE ANALYTICS & ADWORDS · 5-MINUTE READ · By Tina Arnoldi on July 10 2017. The number of mobile users has surpassed the number of desktop users and will only continue to rise. Many people start their consumer journey on a mobile device, but may visit the same website on a desktop computer to complete an action. Because of this behavior, marketers need to consider the influence of mobile in consumer purchasing and track behavior from the very beginning. There are several considerations for tracking the path to purchase for a single user and options are available in Google Analytics and AdWords for properly tracking the full journey. Businesses with multiple assets – such as websites and apps – need to understand the full landscape across all devices. In addition to basic metrics in Google Analytics on the device category or having the ability to filter data by device, marketers can also view a device paths report which shows the consumer journeys on the way to purchasing a product if a website has User ID enabled properties. 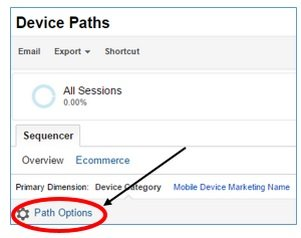 This feature in Google Analytics helps understand the specific device paths that lead to conversion. This report shows the proportion of devices used and how they interact with each other, including revenue attributed to the originating device compared to devices used later. Understanding where in the purchase process a smartphone was used can help with decisions about appropriate marketing messages at each stage of the buyer journey. The default setting with Google Analytics is a Client ID assigned to each device, but the ability to track this full journey for each user rather multiple new sessions on each device can be done with the User ID. When the User ID is not used, Google Analytics sees multiple users for a new session when it may actually be the same user on a different device. 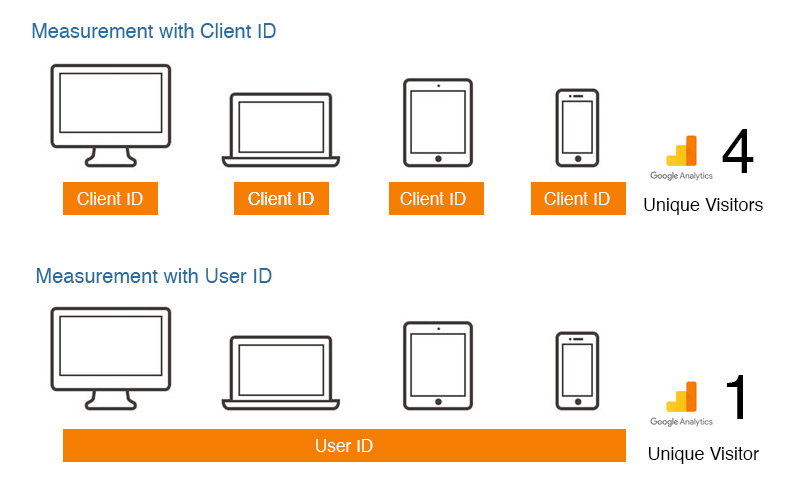 With the User ID view, marketers can instead link sessions together for continuous activity on the website for one user experience across devices. Ensure sure the User ID is not recording when users are not logged in. Measurement strategy has not kept up with the activity on cross device behavior but we are seeing improvements. Since multiple sources are consulted before ever making a purchase, it is a complex journey for marketers to track. Last click attribution has been a popular model for marketers, giving credit to the action that happened right before the conversion. But many campaigns will not drive immediate conversions which is missed when only measuring last click. Google announced in May that Google Attribution is coming soon and will be eventually be available to all marketers. 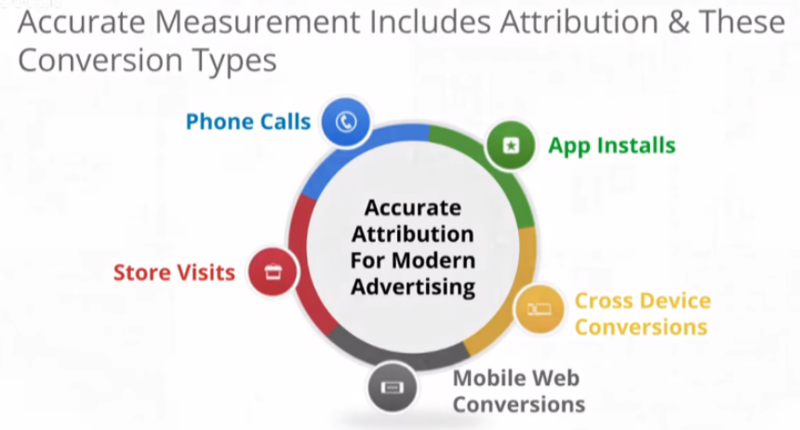 Accurate attribution is especially important on mobile devices based on the number of possible actions that can happen on a smartphone. Until Google Attribution is released to the public, marketers have access to assisted conversions and can make decisions based on assist ratios, which are calculated by dividing the assist conversions by the last click conversions. A ratio greater than one aligns with an assist conversion and a ratio below one is mostly attributed to the last click. Assist data is commonly viewed for the different marketing channels. And for those who have set up a User ID view in Google Analytics, assists can also be viewed by the device in addition to the channel reports with cross device reports. With that data, website owners can connect data about the different devices during different sessions and better understand what visitors do at each step in the conversion process. Unlike Google Analytics, where all marketing channels are monitored, this cross-device conversion metric is for Google AdWords users. This allows advertisers to monitor conversions when someone clicks an AdWords ad on a device but converts on a different device. This metric can be used for optimizing campaigns. However, this will not capture every single click because consumers may not logged in to the browser during some searches, but this can at least help with trends. The entire experience on your website needs to be focused on the users, making it easy for them to complete a desired action. Designing with the following best practices is a win-win for users and site owners. 1. Encourage cross-device activity by giving visitors the option to log-in to your website, whether it’s using an existing username and password or by using their Google credentials. If visitors do not convert immediately on a smartphone, you want them to easily save their search or shopping cart in their account so they can easily convert when they are back at their desktop computers. 2. Use the same tag for desktop and mobile websites. If you have a different website for your mobile traffic, you want to have the same tracking on both versions in order to collect data on cross-device behavior. There is not a separate step for responsive sites – this is only if there are two versions of the same site. 3. Present a call-to-action (CTA) that can be done on the current device. If you present a CTA that is too complicated for the smaller screen of a smartphone, people are not going to complete the task. Make sure you ask users to do something that is possible at that moment. 4. Make phone calls from your website trackable. If someone goes to your website from your mobile device to get your phone number, you naturally want to have it hyperlinked so they can click-to-call rather than manually writing down your phone number before calling from their smartphone. When it comes to reporting on mobile device activity, all businesses need to measure this activity and understand how behavior varies based on device in addition to taking steps to track to full consumer journey. Supermetrics’ Google Sheets add-on allows you to pull data from 35+ marketing platforms into a single spreadsheet in seconds. You can breakdown GA traffic by the device and source and report on a number of device based dimensions. Slicing and dicing your device data will help you optimize your overall marketing strategy for today’s mobile world and stay a step ahead of your competitors.